What’s so unique about KLINGERsealex? to 150 bar internal pressure ratings. 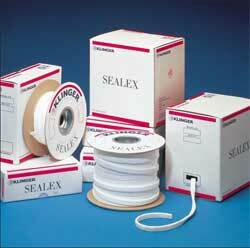 KLINGERsealex can be applied to any sealing face, giving excellent sealing performance even at low bolt loads. of KLINGERsealex, since it can be used practically anywhere. residue material on the flange face is permissible. overlapping at the ends or cut acutely and abutted. That`s all there is to it! 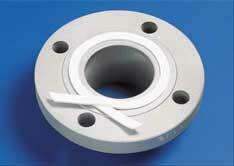 • When the sealing surface or the stability of the flange prevents the successful use of a conventional seal. • When the geometry of the flange seating demands an intricate gasket shape, which is both difficult to assemble and uneconomical to manufacture. • When the flange material will only permit the use of low bolt loads to seat the gasket while the media in the system and the associated interior pressure demands a high integrity seal. These are just some of the areas in which you can use KLINGERsealex. You may have other ideas for its use, either as a replacement for conventional gasketing or as a hidden reserve for unforeseen circumstances. Nothing is left to chance with KLINGERsealex.